The goal of Sort is to eliminate all the unneeded tools and materials and create an organized space free of clutter. This allows for a workflow free from distraction. A good rule of thumb is: “If you do not use it on a daily basis, throw it out.” Everything from the workspace should be removed and sorted into three bins: keep, remove, and holding area. When executing the Sort step, it is important to be vigilant and ruthless; the only items that should be kept are the ones absolutely needed for the job or a process to be completed. 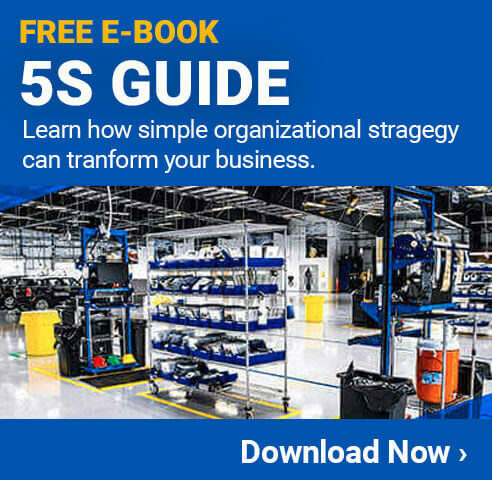 Doing this first step correctly will lay the groundwork for 5S and provide a blank slate to ensure a successful implementation of the 5S model. Identifying unneeded parts and tools is not always an easy task. Employees and managers get so used to the chaos that they don’t even see it anymore. 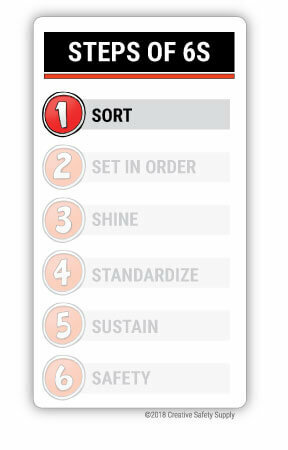 5S has an effective tool that will help with the Sort process: red tags. As employees are sorting through the materials and tools in the area, they will use red tags to classify them. Any item whose necessity is unknown should be marked with a red tag so it can be placed in a holding area. These items should be reevaluated after a set amount of time and either returned to the work cell or removed from the facility. It can be difficult being ruthless and getting rid of materials that have long been in the facility. The red tag system however, allows the user to declutter workbenches and work cells, and take some time to evaluate each item in the holding area.